Updates to Morten (Skip)'s profile since your last visit are highlighted in yellow. Recipient, 2007 National Medal of Arts from the President at the White House "for his composition of radiant choral works combining musical beauty, power, and spiritual depth that have thrilled audiences worldwide." National Endowment for the Arts-Designated "American Choral Master." Recordings of compositions on over 200 CDs, including several Grammy-nominated, and nearly two million sheet music sales of compositions. Most performed American composer of Choral Music. Professor at USC for entire academic career and residencies at over one hundred universities world-wide. Recently named Honorary Artistic President of INTERKULTUR/World Choir Games where the most recent conference in Riga, Latvia had 27,000 choristers participating in concerts throughout the city over a two-week period. Spend summers at waterfront cabin on Waldron Island in the San Juans. 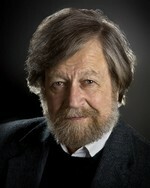 An award-winning documentary, "Shining Night: Portrait of Composer Morten Lauridsen," was released in 2012. Information about the film is at mortenlauridsen.net. Morten (Skip) Lauridsen has a birthday today. Morten (Skip) Lauridsen updated his profile. View.